Getflix is a SmartDNS service offered by Çakinberk Telekominikasyon Internetser Hiz Lim Sti, a Turkey based service provider. Launched in 2013, the service provides an easy way of unblocking location restricted streaming content. In this review, you will learn more about the service itself as well as its advantages and disadvantages. 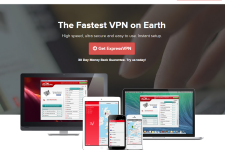 Server Locations & Site Access – Getflix has DNS servers in multiple countries including United States, Australia, United Kingdom, Canada, Germany, Drnmark, Brazil, New Zealand, Japan, Hong Kong, Ireland, Malaysia, Singapore, Spain, South Africa, India and Turkey. Due to its presence in several different geographical areas, the provider can help you to unblock premium services like Netflix, CBS, ABC, Hulu Plus, BBC iPlayer, Crackle, HBO Now, Flixster, iTV Player, SBS OnDemand, Showtime Anytime, Amazon Prime, CNN Go, Sprout Now, PBS, Vudu, Sling International / Dishworld, M-Go, Watch ESPN, Warner Instant Archive, WWE Network,NBC, Tentkotta, DirecTV, NFL Game Pass, ABC News, ABC iView, Pandora, NBC Golf, Crunchyroll, AOL On, Fox Soccer 2Go, ABC Family, Feeln, Acorn TV, Disney Junior, Food Network,Verizon FiOS,Max GO, 9 Jump-in, BBC Sports, Watch Disney, National Geographic Channel, Viki, Funimation, TVCatchup, AMC, beIN Sports Connect (Middle East), Disney XD, CNBC, HBO GO, The History Channel, NFL Game Rewind, NowTV, Plus7, TF1, Sling TV, Showtime, EpixHD, Starz Play, LogoTV, TruTV, FOX Now, Channel 4 (4oD), Arte TV, Livestream NRL, Globo, Sky Go, Zattoo (Switzerland), Star Sports ,Sony Liv Sports, Blinkbox, UKTV, PremierLeaguePass, ICI Radio Canada, Pluzz, Smithsonian, Rugby Live Sport, Eurosport Player (UK), Disney Movies Anywhere, Fanpass, France TV 2, Rhapsody, Global TV, South Park Studios, Canal+,Vevo TV,Dramafever, VH1, DR.dk, Tidal HiFi, Gulli Repay, TG4, France TV 3, The CW, beIN Sports Connect, J-League Live Sport, France TV 4, Beats Music, SportsNet World Now , France TV O, TVPlayer, myCanal, Hotstar, FX Network, France TV 5, Syfy, Songza, MTV, TenPlay, Xfinity, Slacker, Demand 5, TNT, TVNZ, A&E, CBC, Stan, TV3 from any geographical area or country in the world. 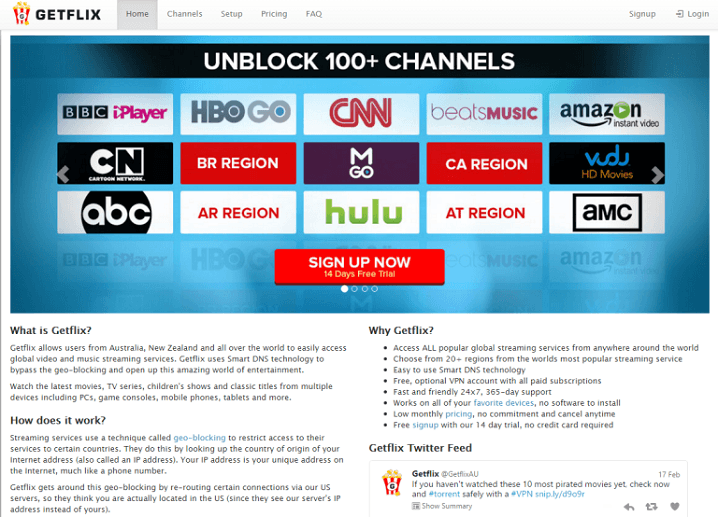 VPN Speed & Bandwidth – Getflix allows you to unblock your favorite streaming services at extremely fast speeds. Since the service routes only a very small part of your traffic (which identifies your location) through its servers, the actual video and audio streaming is delivered at near ISP speeds. Privacy Settings – Although Getflix can see your DNS requests and a part of your online sessions, the company does not log this data nor does it sell, rent or trade your personal data with third parties or marketing companies. And while the service doesn’t encrypt data, the provider offers a free complimentary VPN service to all paid subscribers. Supported Operating Systems – Getflix works on most devices and systems including Windows (10/8/7/XP/Vista), Android Smartphones and tablets, Mac OS X, iPads, iPhones, PS3, Xbox One, PS4, Xbox 360, Apple TV, Wii U, Roku, Boxee, Chromecast, Nintendo Wii, Samsung Smart TVs, Sony Smart TVs, WD TV Live, LG Smart TVs, Blu-ray Players as well as routers manufactured by 2wire, Linksys, TP-LINK, D-Link, ASUS, Netgear, Technicolor and Tomato. The provider doesn’t supply a client for any OS so the service needs to be configured manually. However, the setup is extremely easy and can be done in under 5 minutes on most devices. 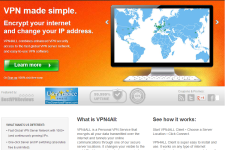 Unlike most SmartDNS service providers, the company even offers a DNS-over-VPN service which allows you to use the service even at places where such content unblocking services usually do not work (example, 3G/4G Network, hotels, college campus, public WiFi hotspots, ISPs that hijack DNS servers etc.). Customer Support – Getflix provides 24/7/365 customer support through support tickets. The support staff may log your traffic for support purposes, however, the company would always take your before committing such activities. The company has published lot of troubleshooting information on its website as well so you may be able to resolve common technical problems on your own. Pricing Options – Getflix’s SmartDNS service costs $3.95 per month, $10.67 per quarter (10% saving), $18.96 for 6 months (20% saving) and $33.18 for a year (30% saving). There is a free 14 day trial available so you can test the service before making a subscription decision. However, the company doesn’t offer refunds under any circumstances. Final Verdict – Getflix offers a very good SmartDNS service. The service not only has servers at many locations and supports a lot more streaming services than other SmartDNS service providers, it even offers an excellent DNS-over-VPN service. For more information, please visit: www.getflix.com.au. 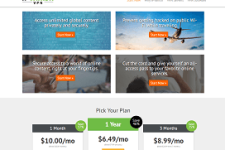 MonkeyVPN Review – Does The Service Provide Value For Money?